Entrance to Fields of the Wood (Murphy, NC). Located on more than 200 acres in the Smoky Mountain foothills, Fields of the Wood is a fascinating outdoor biblical park. 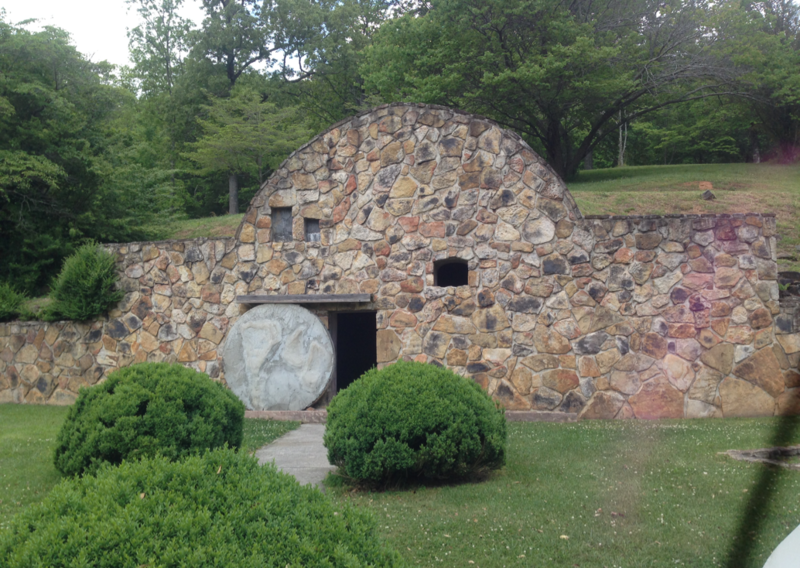 Managed by the Pentecostal Heritage Ministries, the park offers different exhibits that connect the sacred past of scripture with the charismatic past of the Church of God of Prophecy. Free brochure provided to visitors at Fields of the Wood (Murphy, NC). A.J. Tomlinson; Photo from The Church of God of Prophecy. Fields of the Wood started with one man: A.J. Tomlinson (1865-1943). A Quaker-turned-Pentecostal, he often prayed at the location of the Fields, indexed now by the “Prayed and Prevailed” marker. One day, he had a revelation from God, which inspired him to build the ”world’s largest Ten Commandments,” which is still on site. After his passing, his son continued to develop the Fields in collaboration with the denomination. Listen to an audio excerpt from one of Tomlinson's last interviews, where he discusses the site's origins (see transcript). World's largest Ten Commandments at Fields of the Wood. One of the most popular features on site, the “world’s largest Ten Commandments” is 30 ft high and 50 ft wide, displayed proudly upon a sloped hill. It is intended to be a quiet, reflective place to ascend the stairs. But don’t worry, there is also a paved road, so driving to the top is an option. Giant Bible-as-book located at Fields of the Wood. Atop the giant Ten Commandments sits a large re-created Bible-as-book open to the Gospel of Matthew. “On these two commandments hang all the law and the prophets" (Matthew 22:39, KJV). Arches of Prayer Mountain at Fields of the Wood. 321 steps ascend to the top of Prayer Mountain. To the right are 29 biblical teachings engraved on marble tablets. The name of the state that funded the tablet is below the teaching. To the left are four large markers, which depict the “restoration of the New Testament truth.” The stairs lead to the “Prayed and Prevailed” display where visitors are invited to spend time in quiet prayer and reflection. Marble Tablets at Fields of the Wood. Prayed and Prevailed reflection site at Fields of the Wood. Witness Tree at Fields of the Wood. ​On this tree the Church of God of Prophecy displayed their banner in 1941. It was said to have fulfilled Isaiah 13:2, “Lift ye up a banner upon the high mountain exalt unto them.” Later it was the location of a claimed miracle, when a bolt of lightning hit the ground, skipped over the place of the banner entirely, and continued on its path. ​All Nation’s Cross is another grand display. Flags of every nation where the Church of God of Prophecy maintains a church wave above a concrete cross. White Angel Fleet Airplane at Fields of the Wood. In the 1950s charismatic leaders connected air transportation to Isaiah 60:8 and Ecclesiastes 10:20. Modern technology was said to be divinely intended for spreading the “Word of God.” The “White Angel Fleet,” represented by this retired plane on site, was used for missionary trips and distributing Gospel tracts. Read about the Fleet from a 1969 guidebook. Calvary Hill replication at Fields of the Wood. There are only two direct replications from the Holy Land at the Fields. The first of these is a recreation of Calvary Hill, the reported site of Jesus' crucifixion. According to Matthew 27:38, Jesus was crucified between two thieves, which is why there are three crosses present. Garden Tomb at Fields of the Wood. Inside the Garden Tomb at Fields of the Wood. The other re-creation is the Garden Tomb, despite the site's disputed historicity. At the Garden Tomb replication, the door is open, providing an interactive feature where visitors can walk in and “witness” the empty burial site. Baptismal Pool at Fields of the Wood. This biblical getaway wouldn’t be complete without a Baptismal Pool. Note the bilingual (English- Spanish) sign, instructing visitors to arrange their baptism by appointment. Gift shop at Fields of the Wood. To round out the “theme park” experience, Fields of the Wood offers visitors a café and gift shop. Here, there are t-shirts, mugs, and other tourist fare for purchase: as souvenir, gift, witnessing item, teaching tool, and more. T-shirt at the Gift shop at Fields of the Wood.